Thank you for the aesome set! I can't seem to find the sleeves for this, am I just a dork and missing seeing them? Thank you so much for so many great things. Think I missed rating a few but remembered on most pages! Rosie (7 years ago) Inappropriate? What program opens 7z files? Looks wonderful! But the file is a "7z" extension which I've never heard of and my computer hasn't either, LOL! Can anyone tell me how I get into it, please? Thanks! OH! FOUND IT! Did some googling. LOL! Never mind! Jogase (10 years ago) Inappropriate? Oh... no, I didn't. I didn't have their say-so, you see. You know me and having permission and all that. katastrophe (10 years ago) Inappropriate? ugh it cut me off. There's the url to the .7Z compression software. It scans safe from that site on my Koperski, but as with any file you download from the web, be sure to scan it yourself to be double sure. Better safe than sorry, darlings. Yes, the meshes are part of this bundle. This is packed as a .7Z rather than a .zip for the sake of those of smaller/slower bandwidth. Both packages were hefty to start with and combining them, despite my best efforts to compress the graphic files as small as I could without degrading the textures the combined package was still rather sizable. 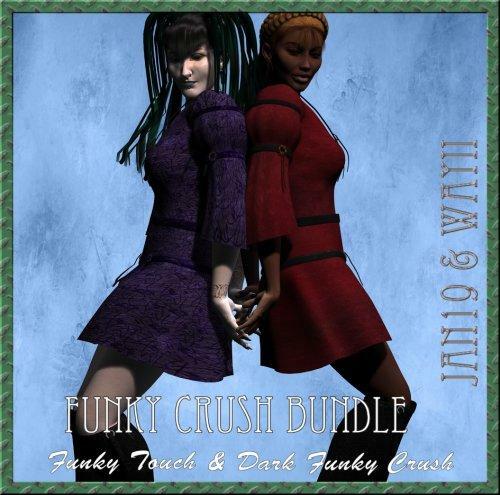 Jan's decided to have me bundle Funky Touch in with Dark Funky Crush so you guys don't have to wait forever. Don't forget to thank her if you like the set. She's done a lot for us and deserves the pat on the back. Ooh I haven't seen this one yet! Gorgeous, thank you! Thank you very much Azhra !